isn't this the same BBQ just one pound dearer at Argos? This is a Weber. Same 10 year warranty. I'm after the Weber Premium myself. Trying to hunt down a cheap deal. isn't this the same BBQ just one pound dearer at Argos?57cm Bar-B-Kettle … isn't this the same BBQ just one pound dearer at Argos?57cm Bar-B-Kettle Charcoal BBQ. [url=http%3A%2F%2Fwww.argos.co.uk%2Fstatic%2FProduct%2FpartNumber%2F3450839.htm]http://www.argos.co.uk/static/Product/partNumber/3450839.htm[/url]This is a Weber. 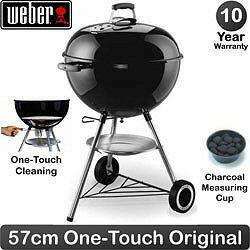 Same 10 year warranty.I'm after the Weber Premium myself. Trying to hunt down a cheap deal. You should get this BBQ for £80. Still don't know the difference between a one-touch and Bar-B-Kettle though so maybe a little research is required. Costco have the compact and a gas Weber only. At least that's all they have in the one on Trafford Park.